A funny thing happened to me on my way to the Tribeca Film Festival this year. I made a totally unexpected friend. His name is Rob Schenck. 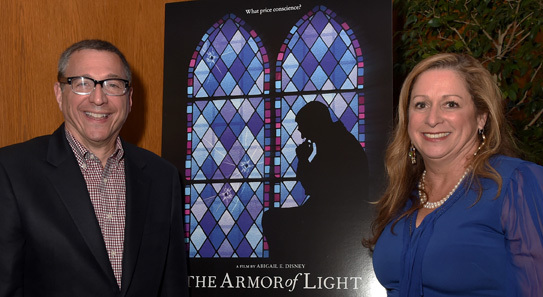 I was making the film THE ARMOR OF LIGHT about guns in America and trying to understand why the overlap between the pro-life community of Evangelicals and the pro-gun community of conservatives seemed to be so absolute. To my naïve eyes, the contradiction looked totally untenable. I looked for the most ferocious pro-life activist I could find who would talk to me. When I sat down with Rob, I expected a fire-breathing dragon and what I got was a mensch. I expected, frankly–and this is me revealing a deep prejudice–a not very bright person. Instead I met an articulate, deeply feeling, genuinely compassionate man. So as it turns out, there is quite a generous amount of space above politics, and you can choose to inhabit it. I made another friend on this film too. Lucy McBath. Lucy was easier and certainly not surprising for me to like, and her friendship was not the startling thing Rob’s friendship has been, but a revelation and a gift nevertheless. Both Rob and Lucy are people who don’t just talk about their faith. They inhabit it. They embody it. And so, whether by coincidence or by plan, I’m not sure, both of these friends have forced me to focus on one aspect of my life that I had hoped not to have to trouble with once I had left the confines of home. And it is to both of them that I am deeply grateful for bringing me back into relationship with an aspect of my heart for which I had forgotten I was hungry. I have spent a lifetime in struggle with the idea of faith. Faith, as it was modeled for me in childhood, was an inscrutable concept. It was something you were born with and never questioned. You either had it or you didn’t, and if you didn’t there was something wrong with you. I spent many a Sunday morning in mass waiting and hoping for some of that magic juju to rain down on me from the pulpit, and it simply never did. I began to suspect that something else was going on here. I began to think that the people who talked about their faith all the time were just the like folks telling the Emperor how nice he looked in his new outfit. I thought maybe the consequences of confessing to doubt were so dire that everyone simply chose to play along, just to make their lives easier. Faith or no faith, when you are born into a highly observant family you are essentially handed your script for living. For some people, the script is a life preserver and they cling to it with all the strength and conviction they can muster. For other people, the script is a noose and they can find no better course than to run from it and from every approximation of it that they encounter. I was in the latter category for much of my life. I saw the slavish observations that my mother and her mother went through as nothing but empty ritual, the kind of rote behavior that emptied the soul rather than filled it. I thought of their obedience as a kind of coward’s retreat from the problematic of thinking for oneself. I watched as they submitted, time and again, to the wisdom and judgment of what so often seemed like the most mediocre of men, and I confess I felt contempt for them, the kind of contempt that came from the worst part of my heart–the kind of contempt that, if you let it go unchecked, can hollow you out and make you mean. It has become popular lately to lay emphasis on all the ways in which religion as an earthly institution drives men and women to do stupid, greedy, and criminal things – small, medium, and large. There are sneering atheists everywhere we look, and their contempt for people like my mother, even though I once myself shared it, has lately made me want to rise to her defense and to the defense of women and men of deep faith in general, a terribly ironic place for me to find myself in middle age. What I’ve come to see as an adult is that while there are surely quite a number of corpses piled up at the doors of the world’s many faith traditions, that pile is nothing in size or significance compared to the accumulated effect of all the kindness, love and decency brought to the world every single day by men and women of faith—simply as a matter of routine. If you added together all the misuses of religion for earthly, political and financial purposes for all of human history, the sorrows and the suffering would still not come close to outweighing all the good that faith has brought to the hearts of all of our lives, even if that good is rarely seen, remarked upon or credited. Evil, let’s face it, has a far better publicist. Ten years ago, I’d have laughed in your face if you’d told me that I’d be ‘palling around’ with a man like Rob Schenck—a lifetime foe of pretty much every political principle I have ever fought for. And yet, I’d take Rob Schenck’s unhip piety over the smirking certainty of a hundred fashionable atheists any day of the week. I might not have been surprised to be friends with Lucy, but I’d sure not have expected that I’d be making a film which didn’t edit out all of her incredibly profound professions of faith the way we lefty progressive filmmakers generally like to do. During one of our interviews Rob mentioned a verse from Hebrews that finally turned a light on over my head about faith: “Faith is the substance of things hoped for, the evidence of things not seen.” Faith isn’t some private club you need a secret password to get into. Nor is it a limb you are either born with or without. If faith is the substance of things hoped for, my goodness, I’ve been a woman of faith all along, it’s just that I was calling myself an optimist instead. In a world littered with sorrowful and lost souls, overpopulated by arrogant intellects cackling confidently over the foolish and deeply uncool rituals of faith, I have come to see both sincerity and submission as acts of the most profound and rare kind bravery and faith as the life preserver that sat at my fingertips all along. I am deeply indebted to Rob, Lucy as well as my friend and peace activist Leymah Gbowee for showing me that.